Reston, Virginia – October 29, 2013 – Bella Solutions, a recognized software developer specialized in technology for Field Service Industries, recently launched Version 5.2. This upgrade notably simplifies the task of scheduling and dispatch, resource allocation, and real-time communication between office and field. In response to customer input, Bella Field Service Software version 5.2 now offers custom data field inputs, email and text alert default settings, and work order tracking. 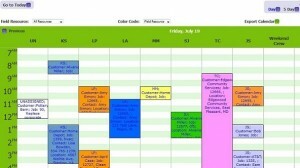 The company also launched enhancements to its calendaring feature to make dispatch more efficient and organized. Custom Data Field Inputs: The Work Order interface has been enhanced to allow for three different types of custom data fields including standard text, a check box, or a drop-down menu with a custom list of options. With this enhancement customers may now create a custom checklist, or survey, and much more. 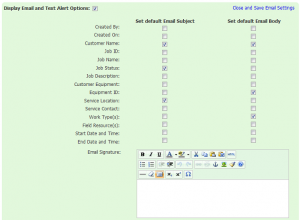 Email and Text Alert Default Settings: To save users time and notably enhance their experience, Bella Solutions now offers auto-population of job information within email alerts sent to customers, technicians, and sales representatives when jobs are scheduled. Email settings are customizable to automatically include the customer name, job status, service location, start or end date and time, work type, or other important information within the subject or body of the email. Users may also opt for a customized email signature. Work Order ‘Created By/On’ Stamp: To boost tracking and accountability, Bella Field Service Software version 5.2 now offers the option to display who created each Work Order and the date and time created. A date and time stamp is also displayed when the Work Order is modified for tracking purposes. Enhanced Scheduling and Dispatch: Bella now shows each field resource within their own column when using the calendar ‘Day’ view, with the option to color code each individual and display either their full name or initials. Appointments may be drag-and-dropped efficiently into another time slot or assigned to a different Field resource. Additional calendaring enhancements include more prominently highlighted unassigned jobs and color coding capabilities to customize Location Zones and group appointment Job Status. “Our latest enhancements improve dispatch efficiency, optimize technician time in the field, and elevate overall usability,” explained John Linn, CEO of Bella Solutions. “Everyone at Bella Solutions would like to thank those users who offered real-world feedback on usability, helping us continually refine our features and functionality to improve our customer’s day-to-day business operations and job satisfaction. Learn more about Bella Solutions and its Field Service Management Software at https://www.bellasolutions.com. Bella Solutions is a leading Software-as-a-service (SaaS) provider specialized in field service management solutions for a wide range of industries including Construction, Property Management, Cleaning Services, Window Washing, Carpet Cleaning, and IT service firms. The company was founded in 2005 and serves clients nationwide from its corporate headquarters in Reston, Virginia and satellite office in Atlanta, Georgia.